A few months ago, I had to opportunity to look at The Brookshire Family by Glenna Brookshire Beck. I got a lot of great information which I’m now validating. My current focus is to look online for original records that are cited in The Brookshire Family or for other original records that support the information included. The book is organized in descending order, meaning that it starts with the oldest known generation and moves forward in time. So, I’m starting with due diligence on the immigrant couple and their children. Esther was born 12 Apr 1680. Margaret was born 10 Jul 1682. Mary was born 28 Dec 1687. The two entries above could be the same James, as the index cites two different sources for the information. This needs to be resolved however. 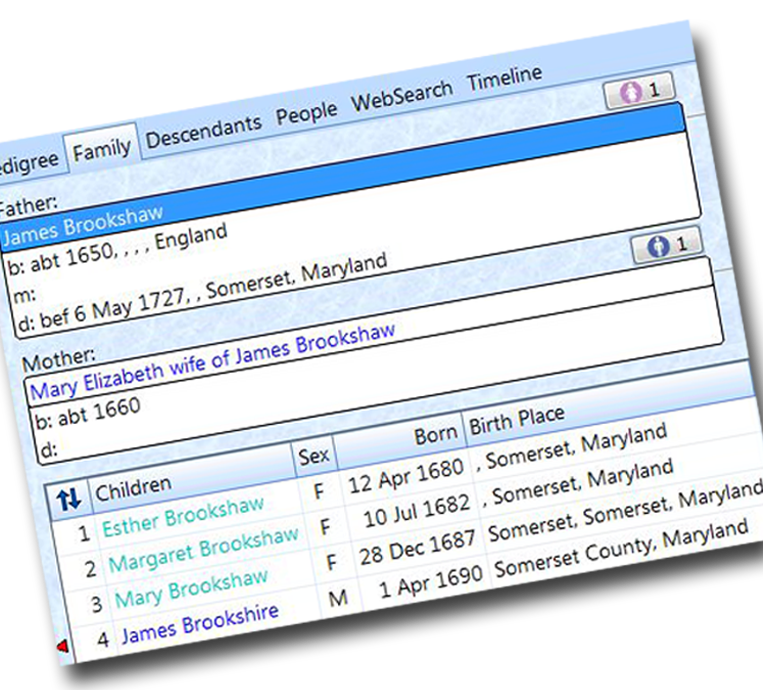 I searched the database for Brokshaw, Brookshaw, Brookshire, Brookeshire, Brookeshaw, arriving in Maryland from 1669-1679 to ensure this was the only James and Mary. The only other Brookshire was an Isaac Brookshaw, who landed in Pennsylvania in 1683. Brookeshann is likely an indexing error; w would be easy to mistake for nn in old handwriting. Further research needed to prove that Mary and Eliz. are the same person. Ordered the FHL microfilm cited in the FamilySearch database. Look for original records when film arrives. Move on to validating daughter Margaret in online records. Search Maryland Online Archives for information on this family. Look for a copy of Gibb, Carson. A Supplement to The Early Settlers of Maryland by Carson Gibb (passenger list source). Look for a copy of Skordas, Gust, editor. The Early Settlers of Maryland: an Index to Names of Immigrants, Compiled from Records of Land Patents, 1633-1680, in the Hall of Records (passenger list source). Gibb’s work is online at http://www.msa.md.gov/msa/speccol/sc4300/sc4341/html/search.html. You might also get some hints from my latest Archives.com article, “Essential Records for Finding Your Colonial Maryland Ancestors” at http://www.archives.com/experts/hait-michael/records-for-finding-ancestors.html. 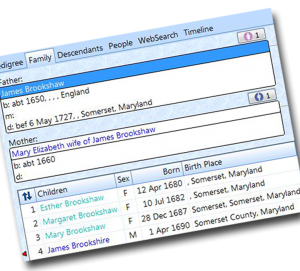 You can also find the deed books for Somerset County online–these are the books referenced by Familysearch containing the birth records. Unfortunately the references you have in your citations are not correct. There is no such thing as a “Maryland Circuit Court,” and the county circuit courts were not created until 1851. During the seventeenth, you would be dealing with Somerset County Court. There is more that I could tell you, but I will just recommend that you take a look at the original entries. Free access to Maryland deed books is available at http://www.mdlandrec.net. You will need to register for a password, which should be emailed immediately. Once you login you can look at any of the deed books or deed indexes. Type in the references I gave you (Book IKL, page 17 and page 20) to see the records. Thanks, Michael! I ordered the film that the FS index entry was pointing to. Maybe I can cancel the order, since these books are online. That is great information to have. I’ve done very little Maryland research, so I’m not familiar yet with everything that is available online. Regarding the citation, yeah, I didn’t think that was quite right. I got the Circuit Court part from something I saw in the FS catalog. I really just used that citation as a placeholder until I can get the original records. I should have looked up the history of the court system first, to figure it out. Thank you, Tonia, for modeling what one day of research looks like. This is really instructive to me as an amateur (aspiring to more). I can clearly see what you’ve done using basically two databases and the book by Glenna Beck. Several points amaze me: (1) Michael Hait immediately chimes in with a URL for Gibb and several other super tips. Wow! (2) Your footnotes are impeccable (I’m a retired college prof). and (3) You “allotted” a chunk of time for this research? People do that? Allot? I’m way impressed. I’m still scrambling to get blogs read, webinars watched, and my own research advanced bit by bit. Thanks for this blog that teaches me more about the genealogical community. Isn’t Michael awesome? I’ve already found the original records, based on the pointers he gave me. I’m trying to be more methodical in my research and not go off chasing whatever is new and shiny. I have so many projects I’m working on and my time is very limited (I have a non-genealogy job). I find that if I don’t say “I have X hours to work on this project,” that a day will go by with not much really accomplished. I also find that if I don’t write down the process I followed, the results, and the next steps, that I can’t pick up the project at a later date and run with it. Good luck in your own research!